Cow’s milk and its related products are excellent sources of calcium, an element that is essential for building strong bones when it interacts with the hormone-like substance called Vitamin D.
However, milk isn’t the only calcium-rich food for bone health. This is important, because many people can’t or don’t want to consume milk. Some people are allergic to the protein in milk. Others have to limit consumption due to its sugar, lactose, which can be tough on some diabetics as well as people who digest it poorly. The Harvard School of Public Health (HSPH) notes that milk presents paradoxes. Although its consumption decreases the chance of osteoporosis and colon cancer, high consumption increases risk of prostate cancer and, perhaps, ovarian cancer. Also, HSPH adds dairy products that can be high in saturated fat and vitamin A, both of which can weaken bones. So moderation in all things — an idea that Greek philosopher Aristotle stressed to his students — is a good rule to follow if you love dairy products. 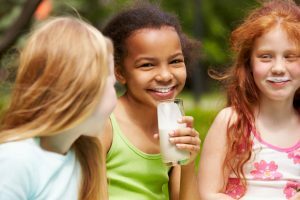 When consuming dairy products or any calcium-rich food, it’s essential to track the amount of calcium and vitamin D you are getting. Check with your general practitioner or orthopedist for a recommendation about how much to consume. A general rule of thumb is about 400 IU of vitamin D paired with 1000 mg of calcium daily. Product labeling can help you gain an idea of the quantities of calcium in recommended servings. If you don’t drink milk, there are many substitutes — such as almond, coconut, rice or soy milks — that are enriched with calcium and vitamin D.
It’s helpful to eat a wide variety of foods rich in calcium, including cooked beans, leafy green vegetables, anchovies (bring on the Caesar salad!) and cabbage-family plants such as broccoli and kale. A varied diet of veggies will also provide vitamin K and magnesium, which help strengthen bones. Don’t forget protein, which also helps build bones but, once again, don’t overdo it. Keep your diet balanced. Many medical experts cite exercise as being crucial in the constant process of rebuilding strong bones. However, there is disagreement about how much and what kind of workouts are most efficient. Keep in mind the idea of moderation, and remember to talk with a doctor before hitting the track with a new exercise regimen. Strive for activity every day and get a feel for the amounts and kinds of exercise that make your body feel good.